Evangelist Janice Twitty Myles is Elect Lady of the House of Prayer Church of God (HOPCOG), Inc., where her husband, Bishop Francis S. Myles, Sr., is the esteemed pastor and Presiding Prelate. She has been his help-meet in life and ministry since they were joined in Holy Matrimony, in April 1995. Evangelist Myles, affectionately known as Sister Janice, attended Sunday School at the HOPCOG, No. 1, located in Capitol Heights, Maryland, in her early childhood, was away briefly after graduating from high school, but, returned in obedience to God, and has been an active member since being saved, sanctified and filled with the Holy Ghost in 1974. Over the years, Evangelist Myles has worked in various capacities within the HOPCOG, Inc., including her service as usher, choir member, spiritual advisor for the Young People’s Conference, Vacation Bible School teacher and with the Prison Ministry. In addition to her many responsibilities as Elect Lady, she is currently the Director for the Women’s Ministries, Assistant Sunday School Superintendent and Adult Sunday School Teacher at the HOPCOG, No. 1. 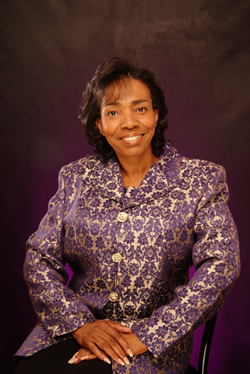 She is also a member of the Holiness Minister Wives and Widows Council of Washington, DC and Adjoining States. Desiring to be the servant of God that He would have her to be, Evangelist Myles continues to “press toward the mark for the prize of the high calling of God in Christ Jesus”. She can be depended upon to share a bright smile, an encouraging word, a heartfelt prayer and significant support to God’s people whenever and wherever required.